The Third Degree travelled to the 'Defending Indigenous Rights: Land, Law and Culture' gathering from the 6th to the 9th of July 2010 in Mparntwe -Alice Springs. These specials feature audio recorded at the conference. Defending Indigenous Rights Special part 1. Broadcast on 29/07/10 - The conference provided a space for Traditional Owners from the NT to talk about living under the 'Intervention' and the proposed nuclear waste dump at Muckaty Station at Tennant Creek. This program features the voices of: Mitch, an Arrente/ Luritja woman, author, poet, artist Marianne Mackay from Wadja country in WA Barb Shaw from the Mount Nancy Town Camp Christine Abdullah, Nurundjeri woman from SA. Defending Indigenous Rights Special part 3. 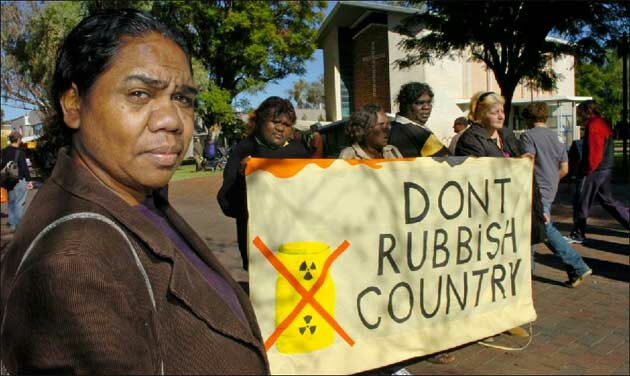 Broadcast on 12/08/2010 - This audio will continue next week with other speakers from the ‘Breaking the Nuclear Chain’ forum at the Defending Indigenous Rights conference. The forum was chaired by Natalie Wasley from the Beyond Nuclear Initiative, and features Raelene Silverton from Hermannsburg as well as Mitch, an Arrente woman, artist, author and poet.